It's the small things that make a difference. In the new kitchen, the commercial kitchen, there is plenty of room for washing up dishes. 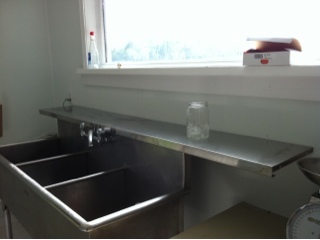 And now, thanks to Homer and his scavenger abilities, we have a spot of stainless steel for setting clean stuff on. Lots of cleaning up today. Mason jars are the first on that list. More seeds going in. In case the squash out there get eaten by squash bugs we have more of those going in.